Initially the data looks like this. 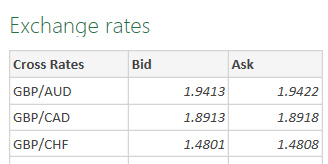 As a bonus task, filter the data to exclude the (pointless) GBP to GBP exchange rate. The investment symbol needs splitting out, and the price should be numeric. Investments sorted by the Change column, with the highest value first. You should filter the table in Power Query to omit any investments whose prices contain $ or € symbols. You can type in a € by pressing Alt + Ctrl + 4. Save this workbook as Splitting Shares, then close it down.